Here is one that your children will thank you for again and again. The set includes a cute little bunny in a basket. 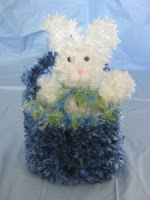 The bunny also makes for a lovely toy on its own, and the basket could be used for candy and such. You will need a boa yarn, an H crochet hook, stuffing and cardboard.